Our famous Bolt-On Pinto Mustang II Crossmember kit for the 1936 Chevy Standard. Easy and accurate installation. Correct geometry. This custom-made fully bolt-on crossmember kit is based on the Pinto-Mustang II independent front suspension system. Adding this kit to your ride eliminates bump steer and other unpleasant surprises resulting in a safe and enjoyable ride. The crossmember itself lowers your car about 2-4 inches when compared to stock, and with the adjustable upper coil spring pods there is about 2 1/2″ of additional adjustment possible to further fine tune your setup, providing the best method available to get the correct height geometry. The interlocking tabs between upper pods and lower crossmember prevent movement. 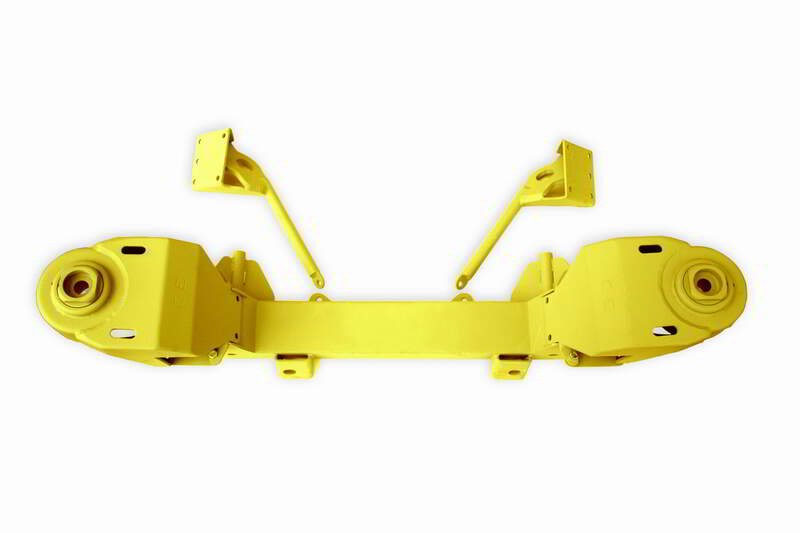 Safety thru Engineering: This fully bolt-on crossmember uses Pinto-Mustang II based suspension components. Using our 50+ years of expertise and experience, we have engineered this system to provide your classic ride with a suspension that is far superior to that of the original Mustang II in safety, strength, handling and performance. Interlocking design: The main bolt-on crossmember cradles the frame for strength far superior to weld-on crossmembers. Chevy frames are too thin to weld on safely and very frequently crack near the weld. Adjustment System: Our exclusive ride height adjustment system enables about 2 1/2″ of adjustable height at the coil spring pods, providing the best method for correct ride height geometry or to fine-tune your ride. Note: The adjustment system provides a quick and easy way to correct the driving geometry of your ride. The crossmember itself will lower your ride 2-4 inches from stock. It is important to keep the lower A-arms level. Our adjustment system allows you to set up the suspension correctly and then adjust as needed as the car settles. Easy and accurate installation: Build using the highest quality standards, our independent front suspension is easy to install. The unique bolt-on system can be mounted safely and securely, and with the included instructions, installation of the crossmember is just a matter of following a couple of steps. The super-accurate fixtures we use when building your crossmember ensure a perfect fit. Recommended parts: Complete hub-to-hub component package, IF-7480TWM when combined with this crossmember builds a complete front end. Kit includes new custom made upper and full lower control arms, spindles with nuts, caliper bracket kit, 11″ rotors, calipers with pads and pins, coil springs, manual rack and pinion, rack bushings, tie rod ends and shocks. The full lower control arms eliminate the need for support rods. To fine-tune our ride height adjustment system easily, consider our custom IFS wrench, set-up rods that temporarily replace the shocks and springs for an easy way to set the correct ride height during the build. 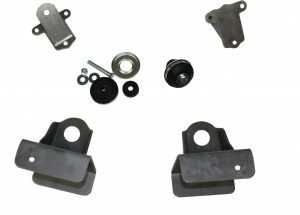 Radiator Support AU-2236, makes a great compliment to this Chevy IFS. For use with a small block engine, we recommend using 325lb coil springs, but others are available as well.